The Stiebel Eltron DHC series tankless water heaters are economical, ultra-compact, attractive, and well built point-of-use tankless water heaters designed for basic point of use applications such as bathroom sinks, kitchens, commercial washrooms, emergency eyewash stations, etc. The DHC series is best suited to applications with a relatively constant flow rate. If the flow rate is likely to fluctuate in your application due to varying water demands or changes in well pump pressures, etc., we recommend that you consider a DHC-E Series tankless water heater with thermostatic control and flow-based power modulation technology. Due to its small size, the Stiebel Eltron DHC 3-1 conveniently fits directly under the sink or adjacent cupboard or closet, so it delivers hot water to the sink almost instantly. By locating the heater right near the point-of-use, you can also eliminate thermal heat loss commonly associated with long pipe runs. 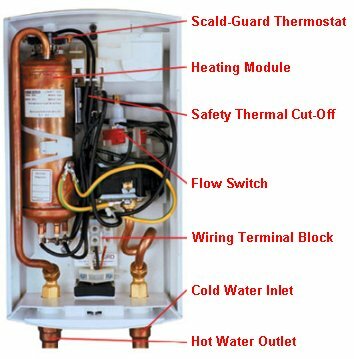 If the DHC 3-1 can supply all of the hot water needs for the room, in new construction applications, you also eliminate the need to run a hot water line all the way from the main central water heater which can save you significant money in plumbing and material cost. By producing hot water on demand only as it is being used, the DHC 3-1 is extremely energy efficient. A sophisticated water flow sensor recognizes when hot water is being used and when it has been turned off, so the unit will activate and deactivate automatically so it only runs when you are actually using water. This eliminates standby thermal heat losses associated with traditional tank type water heaters. Accordingly, you can expect to see a significant cost reduction over the operating cost of a conventional water heater. An exclusive scald-guard thermostat keeps the water temperature within safe limits at all times. Additionally, the DHC water heaters are equipped with a safety high-limit with manual reset. The rugged all copper design ensures many years of reliable service. 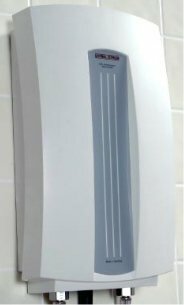 The Stiebel Eltron DHC 3-1 is one of the only tankless water heaters available on the market today that can be run on 120 (110) volt power, however, it does require a dedicated 30 amp circuit and should be wired directly to the main electrical panel (you cannot use a standard plug-in). 0.5 GPM pressure compensating flow reducer/aerators that fit on most faucets are included at no charge. The Stiebel Eltron DHC 3-1 is not recommended for whole house use. For more information on whole house models, see our Stiebel Eltron Tempra Series Whole House Tankless Water Heaters.